Published: Jan. 18, 2019 at 07:11 p.m. Updated: Jan. 18, 2019 at 07:46 p.m. It's Chiefs-Patriots for the AFC Championship in a rematch of a Sunday night funfest from what feels like ages ago. Let's go Behind the O Line to explore this battle for the AFC throne. New England's strength is in its offensive line, particularly in the rushing attack. The Patriots do an almost flawless job with their gap scheme, pulling a backside guard down the line to kick out an edge defender, and follow it with a fullback or tight end pulling from the back side and almost always finish with a positive gain. They do it often and it's rarely ever foiled at the point of attack. The scheme is essentially their bread and butter -- and it's difficult to stop. The reason: The Patriots receive excellent blocking from fullback James Develin, and sometimes from tight end Rob Gronkowski, too. Develin is unbelievably precise; the guy just doesn't miss blocks. He's the model fullback when it comes to leading a running back through a hole, engaging and maintaining blocks while exhibiting an understanding of both leverage and angles. He's not a pancaker, but damn is he consistent, and I'd take his style over a few highlight blocks. Kansas City's hope in stopping New England's rushing attack is, of course, Chris Jones. The defensive tackle forced a fumble against the Patriots in their regular season meeting by shooting the gap created by Joe Thuney's pull on a playaction pass that included gap scheme action up front. Center David Andrews had no chance at blocking Jones, a full gap over to the left, and Jones stripped Brady. This kind of stuff is the exception, though, not the rule. And when going against Belichick and Co., as soon as you show you're onto them, they hit you with a counter punch. Sometimes it's a glancing blow, and sometimes, it staggers you. That's where New England's propensity to run screens comes into play. The Patriots are unafraid to shower an opponent with screens if they deem the play to be a weakness for an opposing defense. They're also not hesitant about pounding a team's weakness for an entire afternoon. Just look at James White's stat line from the Divisional Round. Kansas City's reliance on its base defense and straight rushes could be its Achilles heel, primarily because New England's guards are well-equipped to handle the Chiefs' bull rushes. Jones poses a problem, of course, but it's not nearly as glaring as it was against teams with lesser guards. Thuney and Shaq Mason won't get beaten by such an approach very often. The Chiefs are going to need to bring more edge pressure, and even then, the Patriots just did a good job of limiting one of the league's better edge duos. It wasn't a one-game fluke, either: Tom Brady has been pressured on just 17.8 percent of dropbacks (lowest rate in NFL), and has received an edge pressure on just 9.9 percent of edge rushes (lowest in NFL), per Next Gen Stats. And even when rushers do get close to home, Brady is effective under pressure, throwing nine touchdowns (tied for second-most in NFL) and posting a passer rating of 88.5 when under pressure. It's going to take more than individual matchups. This isn't Madden, this is the best team in the NFL for the majority of the last 20 years. It's time to break out the palette and brushes and get creative up front. The Chiefs don't do much of this, primarily because they really don't have to. They usually win their one-on-one matchups. Jones made almost an entire season out of simply being better than the guards he faced. When the Chiefs fell to the Chargers on that memorable Thursday night, Jones spent much of the night dominating Michael Schofield and Dan Feeney. He didn't need to twist to a different gap; his weaker opponent was right in front of him. Much of the same is true for the other effective Chiefs rushers: Justin Houston and Dee Ford. Kansas City generates a lot of its pressure on the edge, owning a 19.8 percent rate on the edge (second-highest in NFL), and Ford leads the league in turnovers caused by pressure (11). Last week, Houston was part of an overload blitz on the right side and ended up in a one-on-one with guard Mark Glowinski. No offense intended for Glowinski, who had a great season, but you can guess how that turned out. Against New England, the farthest I saw a Chiefs defensive lineman move off the snap in the first half was a gap over, and it was a single-man stunt. They didn't run a two-man game until they showed a two-man front with three linebackers up on the line. Breeland Speaks and Anthony Hitchens ended up twisting, and Thuney and Andrews handled it with ease. Then, the second half arrived and Kansas City realized it needed to get creative -- or else. The first stunt the Chiefs ran in the second half was so unexpected (since they just don't do it often), Andrews chased it, leaving a huge hole through which Reggie Ragland blitzed. Luckily for the Patriots, Sony Michel stonewalled Ragland, giving Brady time to unload the ball. This will be the key to this game, which we should expect the Patriots to have built into their gameplan. It'll be up to the Chiefs to attempt to lull them to sleep with a vanilla first half, or storm out of the gates. Either way, we're headed for a 60-minute chess match in the trenches, and if history is any indicator, the Patriots have the advantage. As for Kansas City's offensive line, the key will be cohesiveness. We know what the Chiefs have in All-Pro tackle Mitchell Schwartz, and reliable tackle Eric Fisher. They're also getting Laurent Duvernay-Tardif back after activating him off injured reserve. He didn't play in the New England game, so it's a little more difficult to project how this one will play out. Plus, the Chiefs no longer have Kareem Hunt, who was a big part of this high-scoring affair. We know we'll get a creatively called game from Andy Reid, a jaw-dropping throw or two from Mahomes and a well-paced offense. But Mahomes will have to be sharper than he was in their first meeting, and not try to do too much, which got him into trouble in their regular-season battle. The rest is kind of a toss-up. Could Aaron Donald swing NFC title game in favor of Rams? New Orleans scored a huge win over Los Angeles back in Week 9 of the regular season, but that was nearly a lifetime ago when it comes to the speed of the NFL. 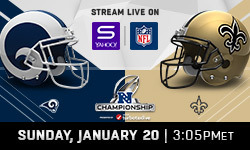 The two teams meet again this weekend in the NFC Championship Game, again in New Orleans. 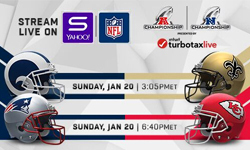 The Saints earned the top seed in part because of the win over the Rams, who finished with the second seed. That difference in record provided the Saints with homefield advantage, but it doesn't save them from another date with Aaron Donald. The defensive tackle has again been a nightmare for opponents, wreaking havoc at a league-best rate nearly across the board. Including playoffs, Donald ranks first in the NFL in pressures (74), sacks (20.5) and sack percentage (3.7), per Next Gen Stats. He's third in the NFL in pressure percentage at 13.5 percent, and that's even more impressive when considering he's an interior lineman who often faces more than one blocker. That's a key detail to note as we head into Championship Weekend. Let's go Behind the O Line to explore how Donald fared in their first meeting, and how it might play out with the NFC crown on the line. In going back to Week 9, it's clear New Orleans accounted for Donald in much of its gameplan. The Saints' first drive was filled with one of two approaches: running away from Donald, or trying to catch him out of position on screens or read option with Taysom Hill at quarterback. When running, the Saints mixed zone and power schemes, frequently running to the opposite side of Donald but occasionally ending up in his path. Donald's best play against the run came in the first quarter, when Donald blew past left guard Andrus Peat to blow up an Alvin Kamara run for a loss of four. When it comes to the pass, the Saints are among the league's quickest-moving units. Drew Brees averages a time to throw of less than 2.6 seconds, taking the shorter pass over holding onto the ball and allowing defenses to pressure him. It's for good reason: Brees owns the third-greatest difference in passer rating when free of pressure as opposed to pressured at -66.7. His 124.7 mark is the best in the NFL when free of pressure, a number produced at least partially because of the Saints' quick-release approach. New Orleans has a rock-solid offensive line, though, so it's not as if Sean Payton is attempting to counter a weakness up front. The Saints just work better when making quicker decisions. That's not possible on 100 percent of attempts, though, leaving the possibility for rushers to cause problems, albeit in a smaller number of opportunities. In those instances, where Donald is concerned, New Orleans tried its best in Week 9 to ensure Donald had to face the most resistance possible. The Saints dedicated second blocker (usually center Max Unger) to helping a guard with Donald, which worked. But in one-on-one situations with relative space, Donald usually dominated. Donald performed better against Peat than he did Warford, who is a Pro Bowl-caliber guard. Donald aligns according to the strong side of the offense, making this a variable that doesn't necessarily allow him to face Peat more often. The Saints counter this with a mix of the aforementioned quick passes, as well as some misdirection (fakes to screens and eventual short passes over the middle). But they can't protect against Donald entirely. They did a good enough job in their first meeting, going without a sack surrendered to Donald, but he still had an impact on the game by registering four pressures. One of those pressures ended with the Saints scoring a touchdown on a pass to Kamara, who slipped past safety Lamarcus Joyner, thanks to Joyner getting caught on a teammate when trying to race to the flat to meet Kamara. That's a circumstantial victory, though. Will they be able to keep Donald off Brees again? It beings with Warford and Peat, and Peat is coming off one of his roughest games with the Saints. Peat committed four penalties (two false starts, two holds) against the Eaglse in the Divisional Round, where he met a similarly forceful rusher in Fletcher Cox. It was revealed afterward Peat was playing with a surgically repaired hand after he broke the hand late in the regular season. He doesn't get a break this weekend, and he might end up being exactly the weakness Los Angeles would like to exploit. That calls for more center help and quick passes, with the latter being right up New Orleans' alley. This could increase the importance of Ndamukong Suh, who will get one-on-one matchups against a guard if Unger is busy helping Peat with Donald. This type of pick-your-poison situation is exactly what Los Angeles had in mind when it signed Suh as a free agent in the offseason. It would also call for some help from a blocking back, but New Orleans likes to send their pass-catching back (Kamara) out as a receiver fairly often. Kamara has lined up outside in the slot on 11 percent of snaps and out wide on 12 percent of snaps, a combined total of 23 percent of all offensive snaps, including playoffs. That's nearly a quarter of snaps that could allow for Donald to get an easier path to Brees. Warford is equipped to stand fairly firm against Donald. He was pretty consistent in their Week 9 meeting. But can Peat stand firm enough to keep Donald from wreaking havoc? Their Super Bowl chances might depend upon it.